Puyo Puyo Tetris mixes two great puzzle games into a third equally great game with plenty of unique modes and challenges to keep you busy for hours on end. 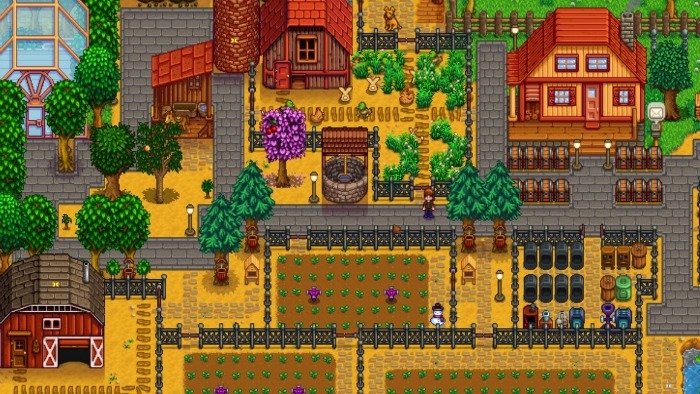 The premise may seem simple, but the game manages to flesh it out and offer a product that will give any fan of the two puzzle games a run for their money. 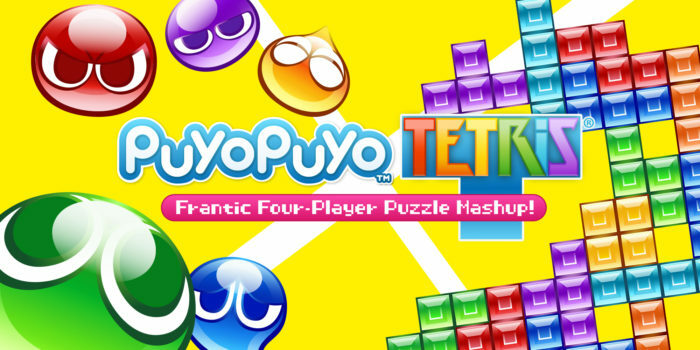 The base of the game revolves around playing either Tetris or Puyo Puyo. For the uninitiated, in Tetris, differently shaped blocks fall from the top of the screen and must be placed to create full rows. Once a row is completed, it will vanish into thin air. If the blocks reach the top of the screen, it’s game over. Puyo Puyo is a similar kind of game but instead of stacking blocks, you are matching up colors of angry looks blobs. The Puyos fall in pairs, often with two colors in each pair. The challenge comes in orienting them in the right way to complete a set of four while simultaneously setting up future moves. Once again, if the Puyos reach the top of the screen, it’s game over. Puyo Puyo Tetris is divided into five main modes: Adventure, Solo Arcade, Multiplayer Arcade, Online, and Lessons. 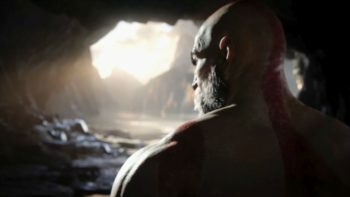 Each one offers a slightly different way to interact with the two games, the biggest ones being Adventure and Solo Arcade. Adventure is almost exactly what it sounds like. 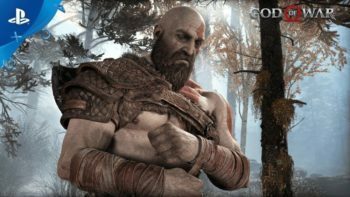 Players are guided through a linear campaign filled with wacky characters that intermittently offers up battles and races against the clock to hit a certain score. 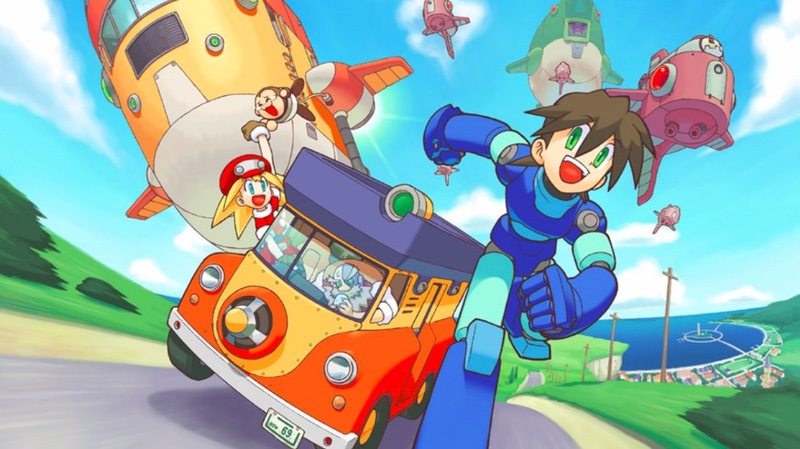 The writing and characters grow more interesting as the campaign progresses, breaking the fourth wall and directly addressing the absurdity of people using Tetris blocks and Puyos to alter reality. 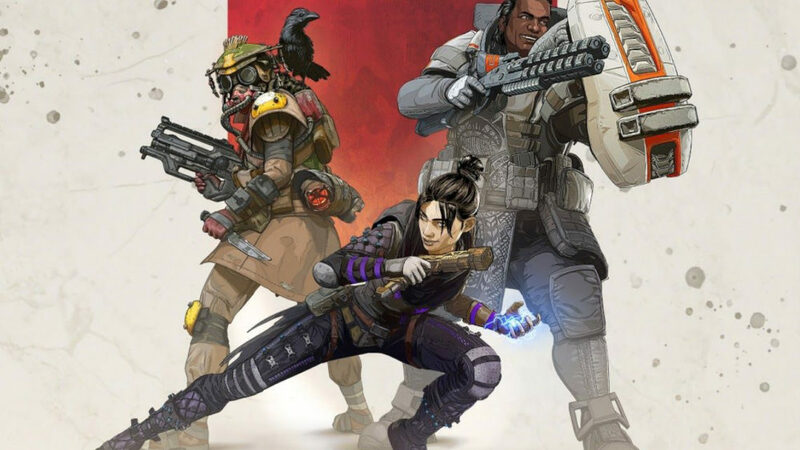 It’s a decently long story, offering plenty of variety and giving players a chance to see everything the game has to offer. 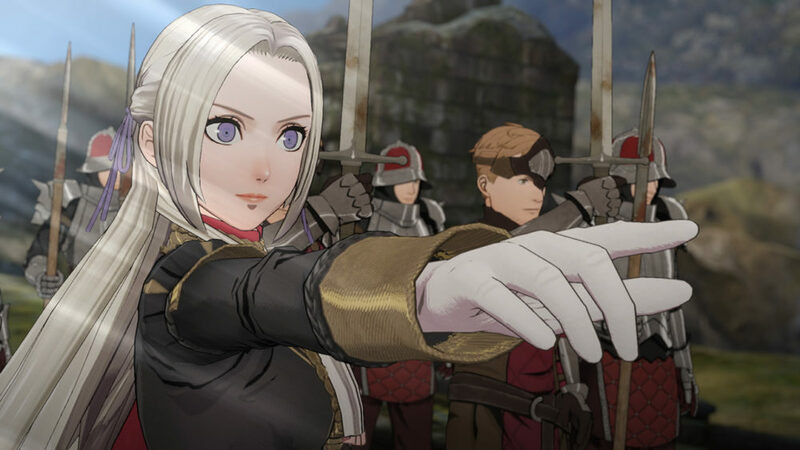 You’ll likely want to skip the cutscenes after a while to get to the next battle, but the challenge of each new stage means you’ll sufficiently hone your skills in the hours it takes you to reach the end credits. The story itself is a secondary concern and is incredibly wordy. You can easily mash your way through the text bubble cutscenes and get right to the bulk of the action but it isn’t as fast as just jumping into a game of Tetris. If you don’t want to experience a story in-between your puzzle game, you can hop right into Arcade, which offers up six of its own modes. Versus pits two to four players against each other with each contestant playing either Puyo Puyo or Tetris. Fusion mixes the two. 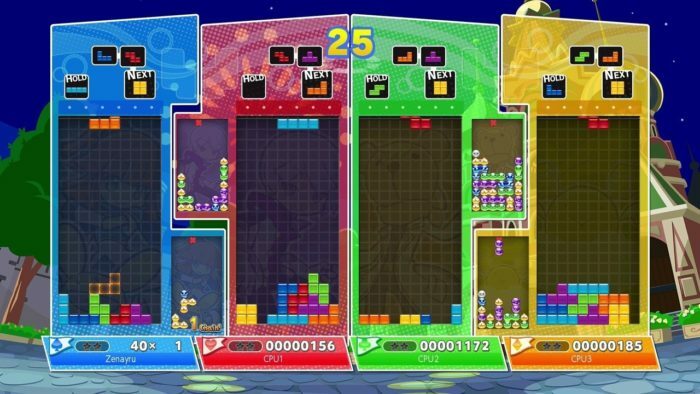 Lines of Puyos will be covered by Tetris blocks, making it more difficult to clear lines or groups. Swap is a fast paced relay. Every 25 seconds, the mode will switch between either Puyo Puyo or Tetris, meaning you need to simultaneously play two games at once. Failure in one will spell disaster in the other. Party is another versus mode where players compete to clear lines around power up blocks in order to hamper the other players’ progress. It’s the weakest of the modes in the game but still a welcome inclusion. The last two game types are Big Bang and Challenge. 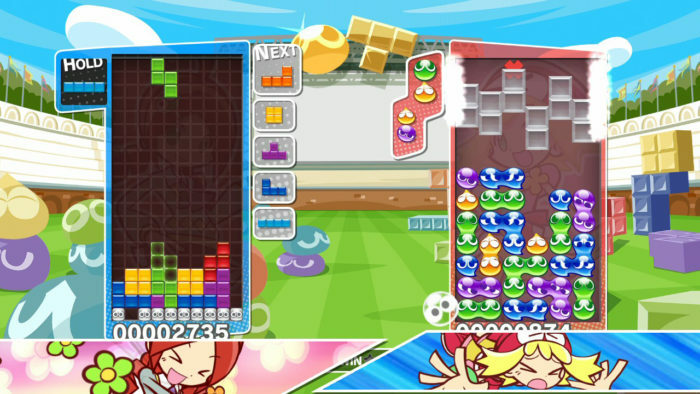 The former has players filling out rows of Tetris blocks of the same shape or Puyos of the same colors to clear the board the fastest and whittle away their opponent’s health. It’s a fast-paced mode that gets even crazier the more competitors there are. Challenge is fairly self-explanatory. You must try to complete a series of challenges that test your skill at either Puyo Puyo or Tetris. Each one has its own hook that keeps even veteran players guessing. Each mode in Arcade can also be played with other players through couch co-op or online play. The computer is incredibly devious and knows exactly where to lay their pieces, but nothing beats the raucous fun of a competitive Tetris match. The entire package is incredibly easy to navigate and very easy on the eyes. All of the modes on offer are fun, even if some are more compelling than others. Once you complete the story mode and unlock all the secret characters, there isn’t much else to do, though. At that point, it’s just a great way to hop into a quick game of Tetris or Puyo Puyo. 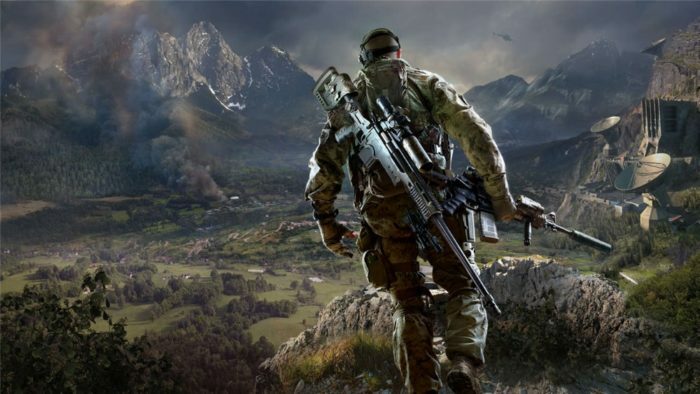 For fans of those series, there is plenty to do and enough modes to keep you busy for hours at a time. 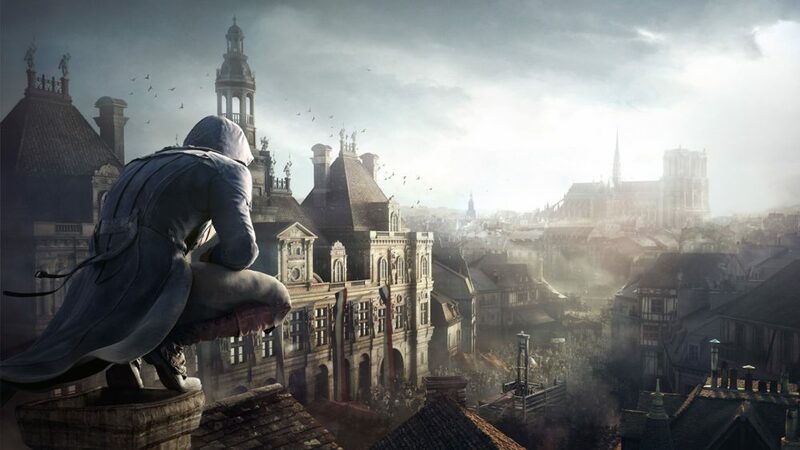 There’s even an option from the main menu to jump into a quick game of either series. It’s a ton of fun but what you see is what you get. So those who aren’t fans of games like Tetris likely won’t have an exceptionally good time. 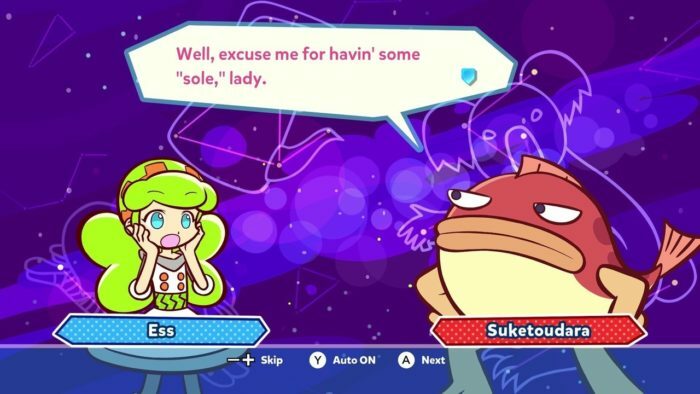 Puyo Puyo Tetris is a great crossover with a fun story and enough modes to keep things fresh for quite some time. The only downside is that it is exactly what it advertises itself as, a mix of Puyo Puyo and Tetris. If that doesn’t appeal to you, then you won’t find much value in this package. But if clearing lines of blocks and grouping together small Japanese blobs is a passion of yours, then this is the game for you. Plenty of modes and extremely fun gameplay. What you see is what you get, essentially.